So how do we catch these. Well we all use the code analysis tools built into visual studio. Don’t we? Well this has a nice test case that will catch and highlight this problem. Run code analysis on your project Alt+F11 or select “Run Code Analysis on …” from the Analyse menu. Then once this has finished you can search for issue CA2241. This will show any and all string.formats that would fail at run time. It would be nice if the compiler caught these but this is still a good approach. I have had to create some code this week that reads the xml created by InfoPath. I then found that if you try and xpath on something you get a null return until the namespace manager has all of the correct entries. In the past I have created these manually but after a bit of google fo I have come up with the below piece of code. It takes an XMLDocument that you have created based on the form file (or any XML document really) and returns you a newly created namespace manager that can be used along side you xpath queries to get the data you want. A client had a fairly simple request to hide some fields when a new SharePoint list item is created but have these fields shown once the item has been created and people edit the form. The short version is that you can use the inbuilt ID field to see if an item is new or not. If the ID field is blank then it is a new form. Here are the steps required so that you can hide fields when an item is being created. Make sure not to hide any required fields or the form cannot be saved. 4. Each field can be hidden manually or all of the fields you want to hide can be added to a new section and then you just hide the section. 5. Now we need to add a rule to the section to hide it. 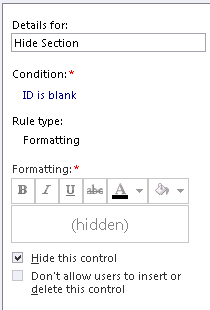 e. From the Rules menu on the left hand side select New and then Formatting. 6. Using the publish button in the very top left of InfoPath publish you changes back to the server. This is just a very basic example. 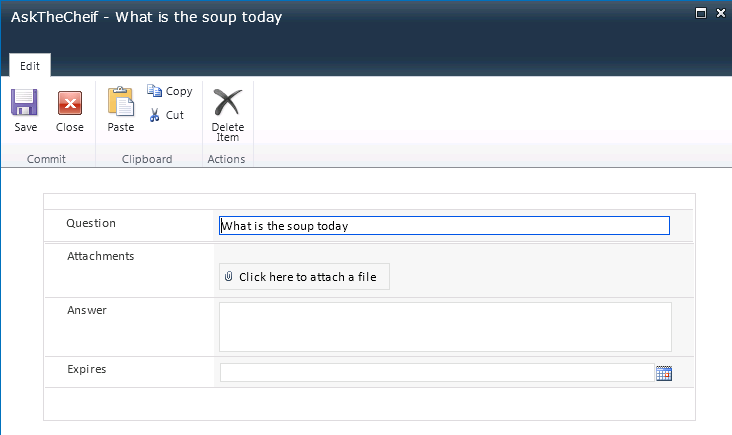 The overall style of the form can be changed using the formatting option within InfoPath. Rule can also be applied directly to some fields so they do not have to be moved into a section if you do not want to. The attachment control must be added to a section as rules cannot be applied against this control directly. Had some fun trying to update a database collation. I didn’t have to worry about the data i just needed to the collation changed so that some cross database scripts would still function in order to carry out some testing. Here is a nice little script I found that will generate scripts to change the collation on the required columns. Some of it fails if primary keys or indexes are against the columns but this will do 90%. Just a very quick post so i can remember this post which describes 5 different approaches to custom logging within SharePoint. A while ago I had a scenario in an InfoPath form where the user could either enter an amount or a percentage value. This value would then get added to a total already in the form. The requirement is that the user enters either value and the form then calculates the other one. So if I enter a number then the percentage gets calculated. If I entered the percentage then the number value gets calculated. 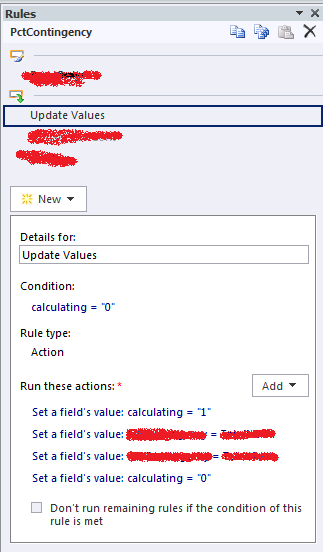 So I quickly setup some rules so that when the value changed the percentage or the whole numbers gets calculated and updates the relevant field. This creates a loop of continually updated fields. I had hoped that some clever InfoPath “stuff” would just make this work and I wouldn’t have to worry about the issue. This didn’t work and caused the form to fail or the fields would not update correctly. The solution to this problem is that you need a third field to control the updates. Mine is called “Calculating” and is a simple Boolean field. Now in the rules for Field1 (number) and Field2 (percentage) the first thing to do is to check that calculating = 0 then set calculating = 1 and then set your field. At the end set Calculating back to 0. This is just a very simple implementation of a lock but it stops the InfoPath rules going crazy.